Our Children's Trust is involved in a landmark federal climate-change lawsuit. Photo by Robin Loznak. Dickinson will present advocacy organization Our Children’s Trust with The Sam Rose ’58 and Julie Walters Prize at Dickinson College for Global Environmental Activism. The $100,000 prize is given annually to an individual or organization that makes a defining difference and advances responsible action on behalf of the planet, its resources and people. 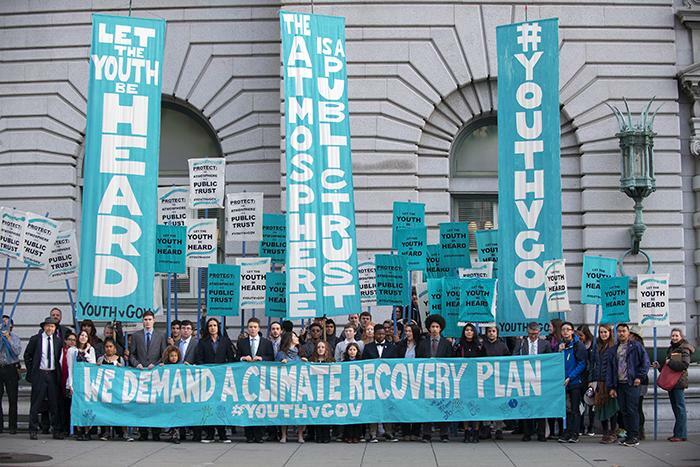 Our Children’s Trust has gained national attention for supporting 21 young people who have brought a landmark federal lawsuit against the president and multiple federal agencies. They argue the federal government’s affirmative actions, supporting fossil fuel development and consumption violate the plaintiffs’ constitutional and public trust rights. The lawsuit, Juliana v. United States, filed in 2015, is named after the oldest plaintiff, Kelsey Juliana. Three years later, the youth continue to successfully overcome the new administration’s multiple efforts to thwart the case, and Our Children’s Trust expects the case to go to trial later in 2018. The suit aims to compel the government to develop and carry out a science-based climate recovery plan to reduce fossil-fuel emissions and draw down carbon dioxide in the atmosphere to levels below 350 parts per million by the year 2100. Julia Olson, Our Children’s Trust’s founder, executive director and chief legal counsel, will accept the prize at Dickinson’s commencement exercises on May 20. Olson has more than 15 years’ experience representing grassroots conservation groups, with a particular interest in the intersection of human rights and environmental protection issues. She teaches environmental courses at the University of Oregon School of Law. In addition to the monetary award, Dickinson’s Rose-Walters Prize includes a short residency in the 2018-19 academic year. Olson will meet with Dickinson’s many student environmental-leadership groups and faculty, participate in class discussions and give a public presentation. Our Children’s Trust has ties to Dickinson through first-year student Sophie Kivlehan, who is one of the plaintiffs in the lawsuit. Kivlehan has been outspoken about the legal action, addressing the issue at the United Nations’ Conference of the Parties (COP) 23 climate summit in Bonn, Germany, in 2017. She is the granddaughter of former NASA climatology expert and activist James Hansen, who received Dickinson’s Joseph Priestley Award in 2013. The award is presented annually to scientists whose work has contributed to the welfare of humanity. Additionally, Dickinson alumnus Patrick McGinley '68 serves on Our Children’s Trust’s board of directors. He teaches environmental, administrative and natural resources law at the West Virginia University College of Law. Previous recipients of the Rose-Walters Prize are Brett Jenks, CEO of conservation nonprofit Rare; Pulitzer Prize-winning author Elizabeth Kolbert; award-winning actor and environmental activist Mark Ruffalo; author and environmental activist Bill McKibben; Apple’s vice president of environment, policy and social initiatives and former EPA administrator Lisa Jackson; and award-winning nature photographer James Balog.